Other names for Type Nine are the Diplomat or the Harmonizer. They are motivated by the desire for harmony, comfort and peace. They want to maintain a sense of inner calm that masquerades as peace. More often, it is a void of energy and aliveness. 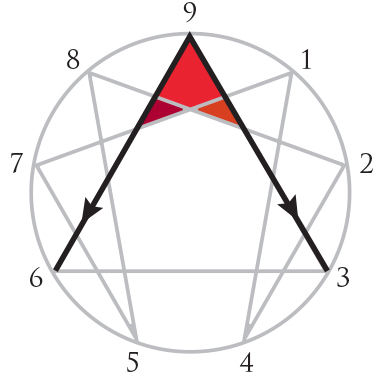 Those who identify as Nines are in the center of the Instinct (or Body) Triad of the Enneagram. They have the most trouble connecting instinctively to what is happening around them. Their emotions and thoughts can be fuzzy and easily redirected. Their energy is found when they become engaged in life. The Passion of Type Nine is Sloth – a lack of motivation to stay engaged. They find their energy in opposition or in alliance with others. They are easily influenced by a stronger personality. The Peacemaker’s Social Role – how they appear in the world – is that of “The Moderate One.” People see them as easy-going, nice, and as someone not likely to rock the boat. Each personality type has a Wing on either side. Through self-observation, you can begin to notice which of your Wings is dominant. Your dominant Wing influences the flavor and energy of your Type. The Challenger will be influenced by Type Eight, the Challenger, or by Type One, the Reformer. Some people report being affected equally by both Wings and some people report not being affected by either. Both of these cases are rare. We do, however, find that a person’s Wing can shift at different times in life. Under Stress, which might be caused by being thrust out of their routine, Nines can “move” to average Type Six, the Loyalist, becoming hyper-vigilant, doubtful and anxious. In Growth, Nines “move” in a different direction, toward a high functioning Type Three, the Achiever. They begin to sparkle with energy and become self-actualizing.